The following is a guest post by Kelly Spradley, VP of Marketing and Sales at Impirus Legal Websites. Florida is not looking too sunny for lawyers today. The Florida Bar recently announced that Florida attorneys must put website testimonials, laudatory statements, and past results behind a disclaimer page. Many Florida lawyers currently have testimonials directly cited on their websites, even though the rule went into effect on 1/1/2010. The testimonials will need to be concealed behind a disclaimer page, but it is not clear as to how rapidly it needs to be done. Although Florida lawyers will need to comply with the new rules, they do not have to submit their websites for review. This is in contrast to Texas where websites do have to be submitted to the State Bar for review. A criminal defense law firm in Houston was recently reprimanded for not submitting its website for review. Lindeman, Alvarado & Frye’s website contained images which were not appropriate for a criminal defense firm. The firm has since removed the images, and paid a $300 fee to the Texas Advertising Review Committee for a belated review. The Houston firm was having its site revamped, which brings up a point about re-submission to the State Bar of Texas. If a website initially passes muster with the State Bar of Texas Advertising Review Committee, does it need to be re-submitted for review every time the website is updated? This would be a great time and financial constraint on Texas lawyers, as websites today are no longer static advertisements. Some websites are frequently edited, as blog posts or articles are added. “Do I have to submit my advertisement for review every year? According to that answer, it seems as if you do have to re-submit your website each time you add an article or blog post. But an email from Gene Major at the Texas State Bar explains that you do not have to re-submit your website (or blog) if you are adding articles that are educational in nature. North Carolina seems to be pretty progressive. But if you cross the border into South Carolina, you do need to submit your websites and videos for filing to the Commission on Lawyer Conduct. Do you know the advertising rules in your state? 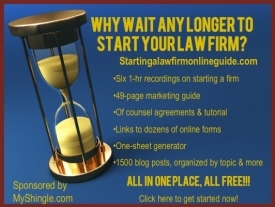 The ABA offers this page with a link to each state’s rules.http://www.abanet.org/legalservices/clientdevelopment/adrules/states.html Even if you read your state’s rules, though, you might be left with a lot of questions. Most of the rules do not address advertising with Pay-Per-Click ads, blogs, podcasts, social media sites, and other internet forums. The people in charge of creating the advertising rules for each state need to update the rules for modern technology. They need to consult with lawyers who are using the internet to advertise, as they are developing the rules. Furthermore, once the rules have been re-defined for the age of the internet, they need to be clearly stated. Internet marketing is a very effective form of marketing for lawyers, and is typically an affordable form of marketing for solos and small firms. However, when the state advertising rules are not up to date, are cost prohibitive, or are murky it is difficult for lawyers to fully capitalize on internet marketing strategies. What do you think? Are your state rules on advertising reasonable? Is it easy to stay in compliance with the rules? Do the rules need an overhaul for Web 2.0?